My wife Julia and I have been blessed five times with healthy children who have grown into young adults. It seems like only yesterday that all five were in tow loaded into the Volkswagen Vanagon for a trip to Grandmom’s, the little league field, or just out to get an ice cream cone. With ten hands to hold, every trip was an adventure. And who can forget our insane idea to go to Disney World. The endless luggage; the airport shuttle to the remote (a/k/a cheap) rental car lot; seven of us in a one-bedroom hotel and the madness of the daily trek to the park with five kids ages 1 to 10. How did we do it? Well the real answer is we didn’t do it, Julia did it. But the favorite trip of all was always the Friday night ride to the shore. The car was loaded down with big wheels, strollers, cabbage patch dolls, and my personal favorite, ninja turtles. For Julia and I, there is no better memory than fishing and crabbing off our dock on Sunset Lake; sunny days on the beach with the boogie boards; and, jet ski rides with more cousins than you could possibly remember their names. “Oh Those Wildwood Days”, special memories of so many special people. Baba, T. Walter, Mom Kramer, Aunt Ruth and Aunt Ethel, Mr. Sterling, Atilla, and of course, the Big House. And although our days on the dock on Sunset Lake continue to provide good memories, the sunniest shore day of all, at least for me, was September 10, 2011, just a few weeks ago. That’s right, 9.10.11. I can remember holding and walking Nicole, our oldest of five, for hours every evening trying to get her to settle down and fall asleep. It seemed like a part-time job, but it was never work. Nicole has always been a blessing. And 30 years later, here I am, holding her again and walking her on the same dock….but this time it’s her wedding day…and she is the most beautiful of brides. Daughters, God bless them, little girls who grow to become women. But to a Dad, they are always little girls, your pride and joy. And as I walked her up this nautical aisle and approached Nicole’s soon to be husband Steve, my only words were “precious cargo”. Steve and Nicole had been dating for eight years. 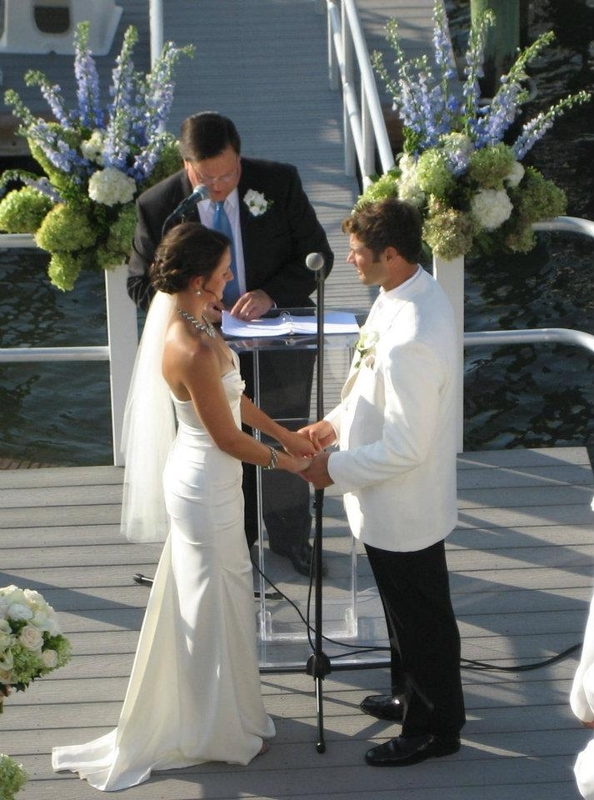 They met on the same dock on which they were married and were engaged on the “lake”. Stevie “Z” (Zamulinsky is a tough one) was beaming on that sunniest of days. Steve, a soon to be candidate for a Master’s Degree in Aeronautical Science from Embry-Riddle Aeronautical University, and a longtime Wildwood Crest lifeguard, could not be a better match for Nicole. Julia and I have had the opportunity to watch Steve and Nick’s relationship mature and they have grown into a wonderful couple. I can truly say I feel our “precious cargo” is safe with a man like Steve. We are so proud of both of them. Steve and Nick understand that weddings are about family, all nine of their siblings played a role in their ceremony. And, we are so fortunate for so many new relationships. Steve is the youngest of six and the “Z’s” truly understand family. Bill and Mary are such a good fit for Nicole, loving, caring parents, who she can count on….and a hell of a lot of fun! 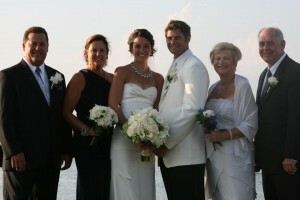 We are also so fortunate to have our parents, Bill and Bunch, and Pete and Joan, attend Nicole and Steve’s special day. They are the matriarchs and patriarchs to whom we owe everything. In a way, your daughter’s wedding can be traumatic, especially for a dad. After all, a young man is replacing you as the most important male in your daughter’s life. But for me, there was no trauma involved. Just a peaceful sense that Nick and Steve are right for each other and will never forget the sunniest day of all – - I know I won’t. 9.10.11 will always be the “Sunniest Day” of my life. Thanks for sharing such a great post, and for making the day possible.